Home » Daily "Home Work" Exercise Regimen! Daily "Home Work" Exercise Regimen! No more EXCUSES! No more LAZINESS! Our health and physical well being should be important to us, but for some reason it always seems to take a "back seat" to the other things going on in our lives! As Martial Artist (in general) and Taekwondo practitioners (in particular), we should be practicing to develop our art every moment of everyday, but sometimes we forget how important it is to maintain our equipment (Dallyon)! 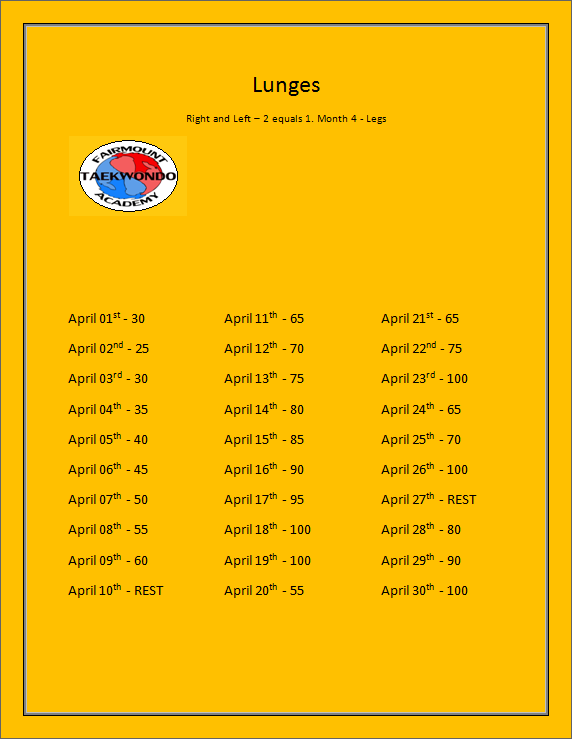 So as a daily reminder there will be a daily chart for each month of the year that will focus on various work outs targeting, cardio, upper body, core and legs. The hope I have for this is that it will give us a small reminder each day that we need to take care of our bodies and also push us to spend a little more time developing or art and our physical conditioning. This chart isn't just for the students! Friends, family and acquaintances of FTKDA are encouraged to join in. 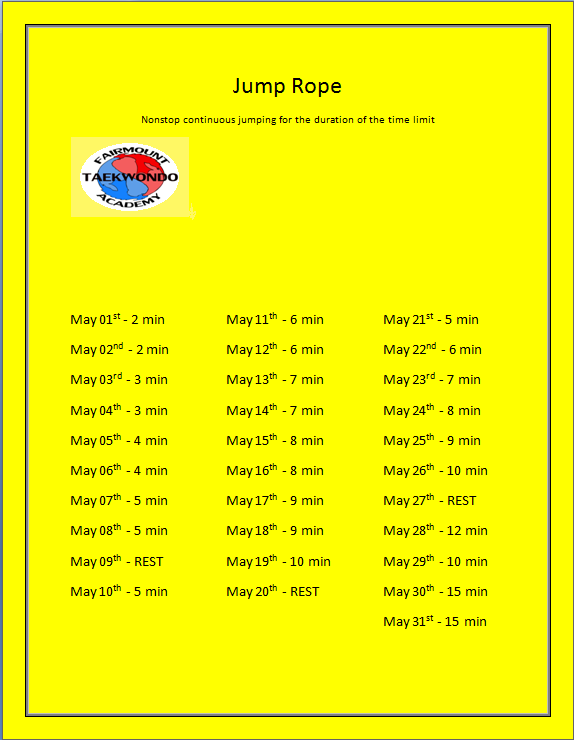 The workouts on these charts will not be specific Taekwondo/Martial arts work outs, but just regular exercise drills and anyone can do to take a small step towards getting into better shape! Under the charts will be a brief tutorial video on how to properly perform the exercise drills and what area you are targeting. 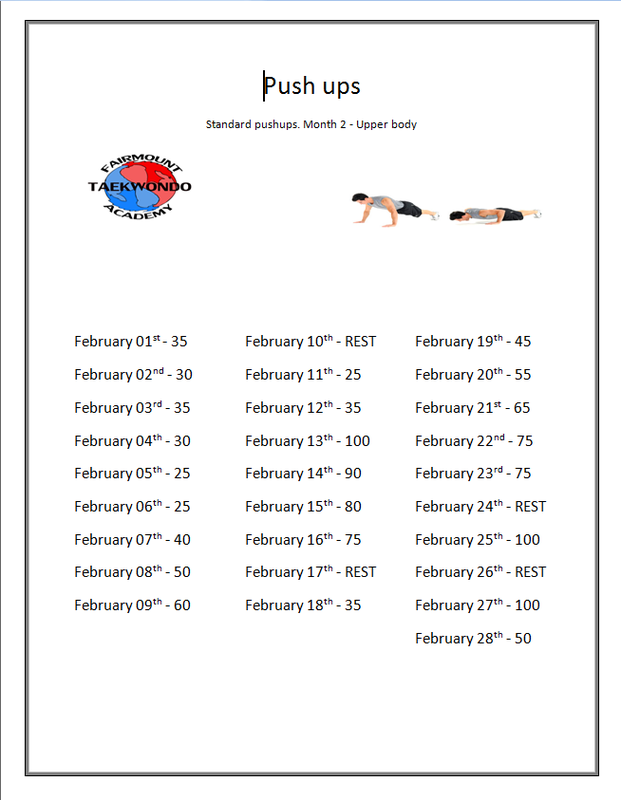 Also for those who are not students or for those who do not work out on a regular basis... each day will present (usually) an increase in the number of each drill. It is important to remember (for those with injuries or some type of disability) that it is a daily chart. You do not have to complete the whole drill in one shot (STUDENTS MUST ATTEMPT TO DO IT ALL IN ONE TRY). For example: 100 squats can be broken down into two sets of 50 or 4 sets of 25... just remember the purpose of these drills is to get a workout. Don't make it too easy on yourself! Lunges from JaSon Floyd on Vimeo. 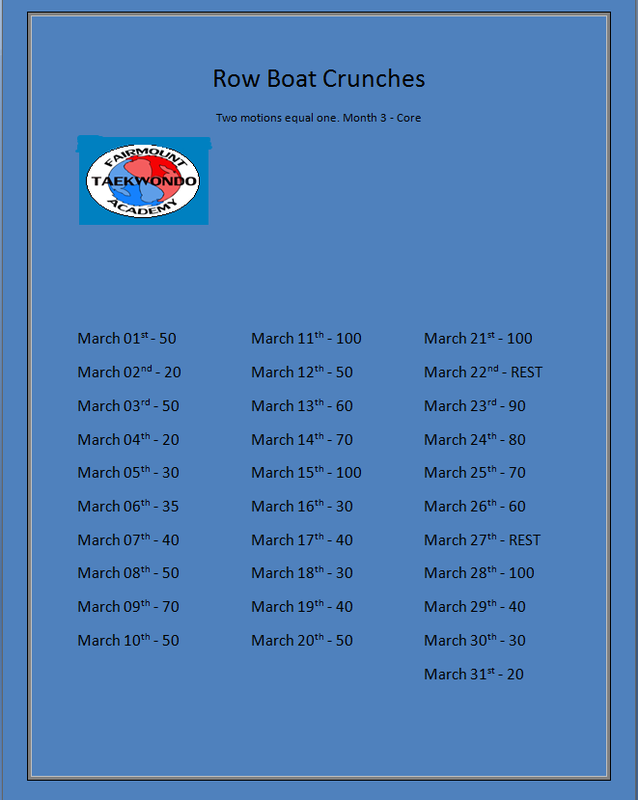 Row Boat Crunches from JaSon Floyd on Vimeo. 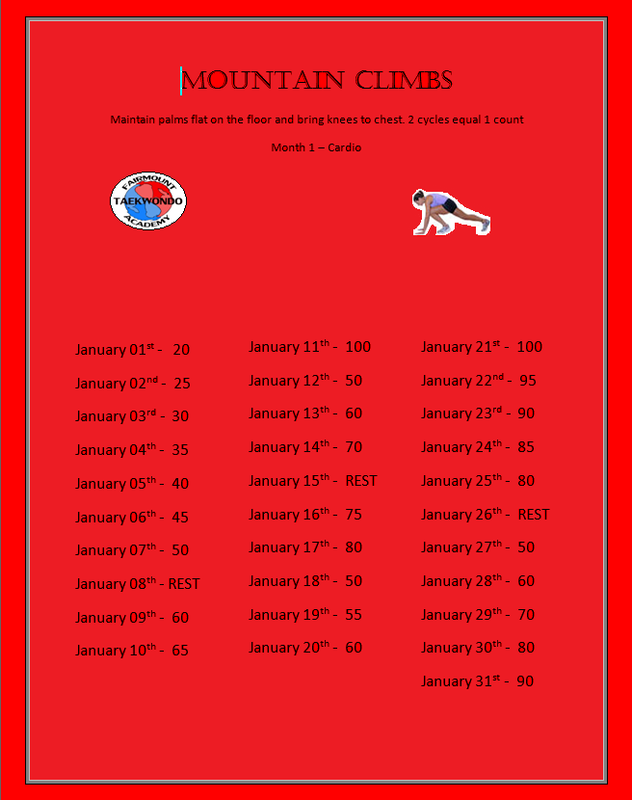 exercise push ups from Fairmount Taekwon-do Academy on Vimeo. Mountain Climbs from JaSon Floyd on Vimeo. Squats from JaSon Floyd on Vimeo.